A report issued earlier this year offers an important view into the problem of families who must flee their homes as a result of gang and other violence in El Salvador. The report on the situation of forced displacement through generalized violence in El Salvador (available only in Spanish) was prepared by the Roundtable of Civil Society against Forced Displacement, made up of several civil society and church groups who have tried to provide humanitarian assistance to these families. The US first started paying attention to the flight of Central Americans from violence in the Northern Triangle when thousands of unaccompanied minors began showing up on the southern border. The primary response of the US has been deterrence -- public service announcements and education campaigns about the dangers of the route north, expanded detention facilities for mothers and children, and round-ups and deportations of families back to Central America. The World Day of the Refugee was June 20. In recognition of that day, I plan to spend the next few posts on this blog on the refugee crisis created by the criminal gang violence in El Salvador as well as Guatemala and Honduras. 700,000 people, or one out of every nine people in El Salvador, suffer from food insecurity, especially in the country's rural areas according to international organizations working in El Salvador. Droughts, the El Niño phenomenon, and the impact of roya (coffee rust fungus), have had a serious negative affect on families incomes and harvests over the past three years. The effects are widespread, touching 104 of the country's municipalities especially in the east. In 24 municipalities, almost 20,000 families are receiving direct food aid. The aid is provided by the World Food Program and the National Council on Food Security. They are images that hearken back to the bloody years of El Salvador's civil war. 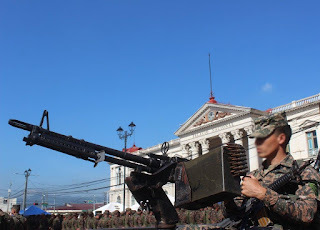 Heavily armed troops deployed in front of National Palace and Metropolitan Cathedral in San Salvador's historic center. On Tuesday, the government of Salvador Sánchez Cerén made a public show of the deployment of "Task Force Historic Center" which includes 800 military and police. From the Facebook page of the Salvadoran armed forces: The historic Center Task Force was deployed this day in 29 sectors with the objective of reducing the activity of criminal structures and bands of organized crime that affect the citizenry and the commercial activity in the zones involved. All this done through joint permanent patrols by foot and vehicle, the capture of criminals in the act or per judicial order, guaranteeing with this free movement and healthy living in the Salvadoran capital. Did El Salvador's 'Iron Fist' Lower Homicide Rate? This post originally appeared at InsightCrime.org. El Salvador officials have attributed a steady decline in the violence-wracked country’s homicide rate to the government’s crackdown on gangs, but it is too early to confirm this causal relationship or to determine whether the improvement will endure. Howard Coto, director of the National Civil Police (Policia Nacional Civil- PNC) announced the lower homicide rates in a June 7 press conference. Coto said homicides dropped from an average 23.8 per day in January to a daily average of 11.3 in May. Homicides declined gradually over the first five months of the year, registering a rate of 22.9 per day in February, 19.7 in March, and 11.7 in April. He added that figures for the first week of June indicated the drop is set to continue, with an average of 7 per day. Hector Silva, who is producing important investigative journalism at the website RevistaFactum, had published a series of articles investigating Rais, the businessman's ties to the former attorney general, and recent seizure of aircraft owned by Rais by the DEA in Florida. You can see some of those articles in English translation on the InsightCrime website here. The long-running attempt by a Spanish court to bring justice in the case of the murder of six Jesuit priests in 1989, along with their housekeeper and her daughter, may be coming to a head. The human rights lawyer who has been in the lead of this human rights case, Almudena Bernabéu, announced an important new piece of evidence. Former Salvadoran president Alfredo Cristiani, who held office at the time of the assassinations, has given an interview where he purportedly acknowledged the responsibility of the Salvadoran military officers. The interview was given to novelist Jorge Galan when Galan was researching his recently published book Noviembre about the massacre. Galan talked to a reporter where he stated that he was put in contact with Cristiani through the ex-president's daughter. In his interview he asked Cristiani about the intellectual authors of the Jesuit massacre, and Cristiani confirmed with the names of the military officials. This picture-perfect country with black-sand beaches, tourist-friendly colonial towns, ideal surfing waves, coffee plantations, and a string of hikeable volcanoes, is off the beaten path for more tourists. The perks -- you enjoy better prices, fewer crowds, and more authentic experiences with the country's warm-hearted locals. Want to learn more? Go to the El Salvador tourism website. 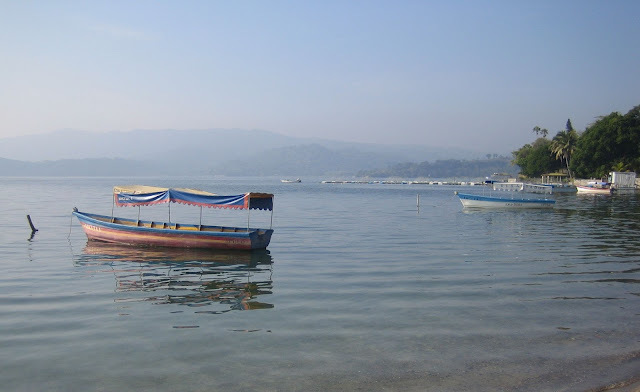 Apopa is a small city to the northeast of San Salvador. It is a place where El Salvador's warring gangs control large swaths of territory and shopkeepers must all pay la renta -- extortion payments. Gang killings occur frequently. A series of arrests on Monday, including the arrest of the mayor of Apopa, showed how deeply the gangs had infiltrated city government. Thirty two persons, including at least 14 city employees were arrested in a series of raids. According to Salvadoran police, the municipal government made available gasoline, cell phones, jobs and other benefits to the gangs. Reportedly more than a a half million dollars worth of fuel was given to the gangs. Gangs could also repair their vehicles at a municpal garage. The municipal police collaborated with the gangs in collecting extortion payments from local businesses. A multi-sector commission is recommending that El Salvador increase minimum wages an average of 15% over three years. The Consejo Nacional de Salario Minimo is made up of representatives of business, labor and the government and is charged under Salvadoran law with coming up with changes to the minimum wage to be proposed to the president. Monthly wages in textile factory jobs will rise over three years to $220 and wages for agricultural works will rise to $128 per month. The government of Salvador Sánchez Cerén had proposed a minimum wage of $300 monthly in urban areas and $250 per month in rural areas. San Salvador's Roman Catholic archbishop declared the small size of the increase unjust and sinful. The party head of the FMLN called the increase a "joke" and asserted that the Consejo had been co-opted by business interests. It seems likely that the president will veto the increase, but this would mean that workers get no increase in minimum wages at all. Salvador Sánchez Cerén completed his second year as El Salvador's president this week. Recent public opinion polls show that slightly more Salvadorans currently approve of his performance than disapprove, but his approval ratings are well below the ratings of his two predecessors, Mauricio Funes and Tony Saca, at similar points in their administrations. According to a La Prensa Grafica poll in May 2016, 48% of Salvadorans approve of the job Sánchez Cerén is doing while 44% disapprove. That is a marked reversal from February when only 36% approved and 55% disapproved. In February, murders in the country had skyrocketed to their highest levels, prompting the government to introduce "exceptional measures" to combat crime including greater militarization of public security efforts and crack downs on gang leaders in the prisons. Salvadorans give Sánchez Cerén an average rating of 5.6 on a scale of 1 to 10 on his job performance in the LPG survey.